Stride - Stride Step - [Discard cards from your hand with the sum of their Grades be 3 or greater] Stride in (V) with this face-down card. 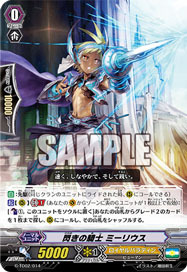 [C] [(V)]: During your turn, all your Front Row Rearguards with Shinken Hissatsu ability gain +3000 Power, and if you have a Hearts card with "Jiroutachi" in name, this gains +5000 Power. I didn't think there'd be a day where I get involved in a battle on the surface again.